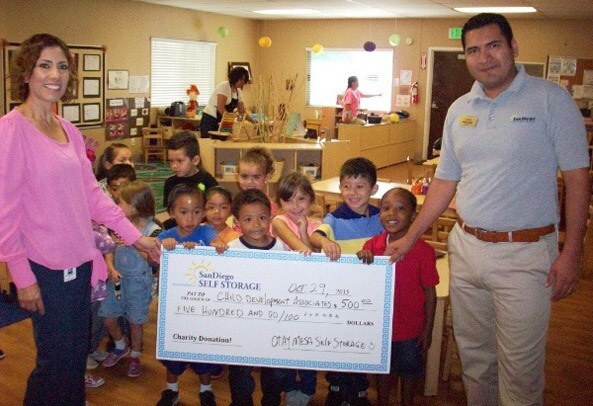 Otay Mesa Self Storage (OMSS), one of seventeen facilities within the San Diego Self Storage (SDSS) family, has proudly supported Child Development Associates. OMSS Manager, Zee Zavaleta, met with leaders and young participants of the program to present a check in support of the organization. The donation is part of a charitable project for San Diego Self Storage staff. Each of the 17 facilities were given a sum to contribute to a local organization. The employees determine who receives the funds. In an email to SDSS employees Zavaleta said, “This was a warm-feeling experience, to know that this check will bring many smiles and opportunities to low-income kids in our community.” The teams who have made their contributions have all expressed that the act of giving to others is tremendously rewarding. It has lifted spirits in the office and created unique bonds among team members as some had personal connections to local charities. “We are an organization of compassionate people who care about our community, and we hope to continue to make a positive impact in San Diego. Our charitable project works to involve our employees, to stress the value of remaining an active participant in the community,” said Director of Operations, Kraig Haviland. Child Development Associates, Inc. (CDA) is a community based, non-profit agency with nearly 200 employees dedicated to creating positive change in our local community. We believe that all families deserve access to quality early care, education and supportive services that will promote children’s healthy development and future success. CDA takes an active role in child care issues at the local, county and statewide level to support child, parents, and child care providers. CDA operates three state subsidized full-day preschool centers in the southern area of San Diego County, an Alternative Payment Program throughout San Diego County, and is the largest sponsor in the State of California of the Federal USDA Child Care Food Program.